We offer scouting services to meet most any need. Scouting offers a wide array of services to farmers, from insect to weed management, and everything in between. We offer soil sampling to cater to each grower's need. From conventional sampling to GPS grid soil sampling, we will help you take the best care of your soils. Through the use of soil moisture monitors, we can help growers make the most out of irrigation. Through the use of these monitors, we can be more timely and effective with our watering, thus keeping more money in your pocket. In business for 10 years, Jesse Story Agricultural Services offers year round services for all agricultural needs. We work with all crops in 9 counties. As a fourth generation farm family, we are ready and able to offer you the most knowledge and expertise for all of your agricultural needs. 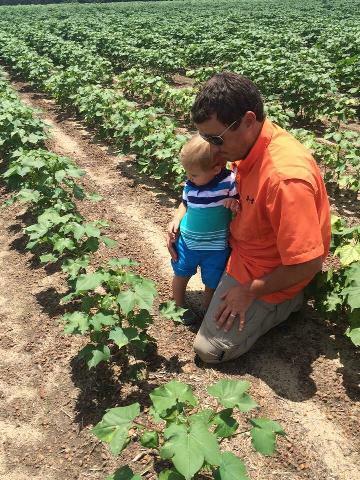 Also, Jesse continues to seek out new technologies, such as soil moisture sensing, among others, to help his growers maximize cotton yields, while becoming better stewards of their own resources. Jesse also budgets time each season to visit fields with us and help us better understand what his growers need from seed technologies to remain profitable.